The United States has established itself as a leading power in onshore wind energy. According to a recent report from the American Wind Energy Association, there are more than 49,800 wind turbines installed throughout the country, producing some 69,471 megawatts of electrical power. While the country has become a leader in wind energy, it is lagging behind in the offshore wind sector. 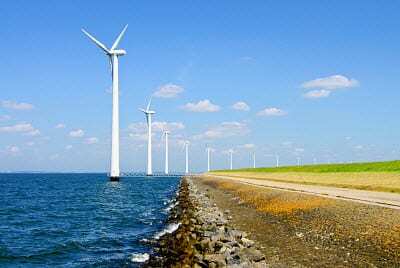 Other countries have already launched large-scale offshore wind projects and the U.S. may be able to benefit from similar projects, if it shows the right kind of support. A new offshore wind energy system is expected to begin producing electrical power in 2016. The project will be taking place off the coast of Rhode Island, being developed by Deepwater Wind. The company notes that the project will be comprised of five wind turbines, connecting Block Island to mainland Rhode Island. Once completed, the wind farm is expected to produce enough electricity to power 17,200 average homes, generating more than 125,000 megawatt-hours of energy every year. Construction of the wind farm reached a milestone in July of this year, showing that Deepwater Wind is on schedule to finish its ambitious offshore wind project. Offshore wind energy holds a great deal of potential. Offshore wind farms could produce more electrical power than onshore projects, due to the strong wind currents that can be found at sea. Wind currents are strong in the ocean because they are not mitigated by geographic structures, such as mountains and hills. As such, wind turbines can exploit the full potential of the wind. Earlier this year, the Department of Energy released a report showing that the offshore wind energy sector has experienced strong growth throughout the country. There are currently 21 offshore projects at various stages of development, accounting for approximately 15,650 megawatts of energy capacity. The project from Deepwater Wind is expected to be the first offshore wind farm to produce electrical power in the country. Offshore wind power generation would be a major source of electricity here on the East Coast while minimizing – if not eliminating – the noise pollution associated with these turbines. Offshore projects pretty much also eliminate the “not in my backyard” argument against these types of farms.